My family can tell you that I consider myself one of the great armchair innovators. Among the many things I believe I invented before they were actually invented is the Keurig coffee dispenser, Netflix (streaming AND original content), and the Amazing Race. The problem I always told myself was that I never had access to the resources required to put my ideas into the market. So when I secured a position managing innovation at a global mega-company, I was excited. Here, I would finally have the opportunity to launch my great ideas, become massively famous, and change the world. Boy, did I have a lot to learn. What soon became clear was that managing innovation for a mega-organization is not about creating great ideas. Of course we had our chance to develop some ideas, but mostly our role was to capture the ideas of leadership, cut through the noise, politics, and disruptions, and push them forward. From the get-go, I was surprised to find that this 150+ year old company did not have any systematic approach to innovation. As a result, the innovation team would shift priorities on a dime and often waste tons of time driving ideas that were clearly wrong for the company, had no foreseeable positive return, or had no internal political support. Meanwhile, many good concepts would go unnoticed, remain on hold, or be shelved. After several bouts with minimal results, I was concerned that my career was slowly wasting away with superfluous efforts; I was converted from a proud, creative, non-linear thinker to a champion of centralized, systematic innovation processes. When the ground shifted, as it will in big companies, I ended up in a new leadership structure and had the chance to implement my systematic approach. I was given four very talented people, and we decided that we would create a methodology to collect, rate, prioritize, and track innovation efforts. It was going to be beautiful! We spent the better part of a year creating a steering committee, outlining our plans, and developing a system for tracking and sharing information. We gained approvals up the ladder for the approach and agreements from senior management to follow the discipline. Unfortunately, we did not launch any more great products or services as a result of this approach. What we did do was find a great way to identify and track all of our failures. We now knew that we had a pipeline of literally hundreds of ideas, we knew where the ideas ranked based on the predetermined parameters, and we had high-level business plans for a small percentage of the top ranking ideas. Unfortunately, our cycle time from ideation to product launch still approached 18 months to 2 years on the very few ideas that actually made it to market. We were not what one might consider an innovative powerhouse. Defining Innovation: Say the word “innovation” to a room of 100 people and you will get 100 different takes on what it means. Some see it as the big new idea. Others are looking for enhancements or improvements across the board. Sometimes innovation is used as an excuse for the strategic flavor of the moment. Separating Thinkers from Doers: Often, the mindset in traditional companies is that there are thinkers who have the capacity and capability to innovate and doers who are either too busy or the wrong personalities. This is Taylorism stuck in our collective psyche and a killer for innovation. Failing to Set Aside Resources: The deadliest phrase in innovation, “Prove the case for it and then we will give you the budget,” is, frankly, just a cop out. Seeding and cultivating innovation requires continuous investment and experimentation. Still, budgeting for the future when managers throughout the organization are competing for resources takes the kind of courage that is often lacking. The Middle Management Filter: Frequently innovation is given to middle management as one of their tasks. It is often part of Marketing, IT, or (God forbid) Finance. Unless middle managers are exceptional, they are rarely in a good position to lead innovation. They live on eggshells, are unwilling or unable to take risks, and are often punished for failure. As a result, they become the bane of the innovation team’s existence defaulting to the safe choices, watering down ideas, and making knee-jerk decisions. Short-term vs. Long-term Thinking: Connected to #4, management is more interested in short term impacts rather than long term evolution. They are measured by what they accomplish in a quarter or, at best, a year. The long term is not part of their mandate. As a result, if the innovations don’t come fast and furious, they can lose support and focus. Searching for the Silver Bullet: More often than not, the innovation team is pressured to find the big idea that pays off quickly for the boss. 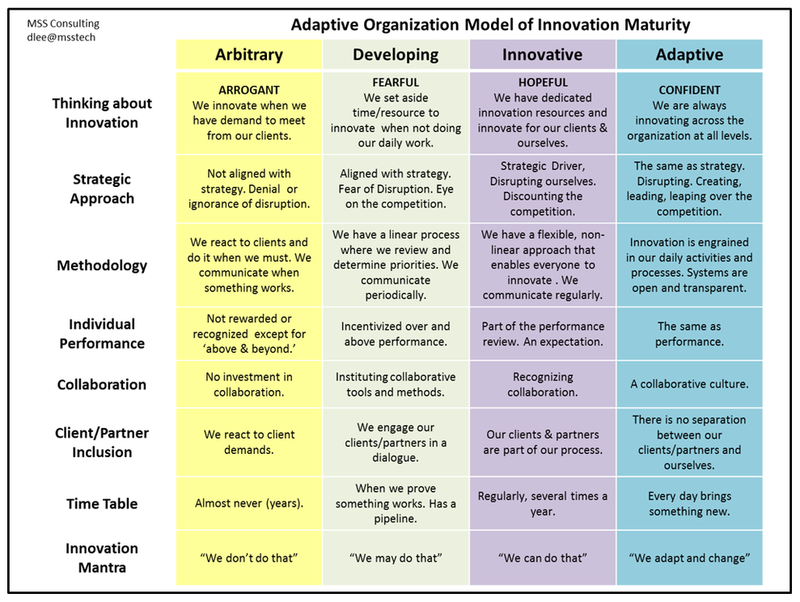 The problem is that innovation, especially in mature organizations, rarely happens that way. So, what to do? Our approach had failed to produce results, and we were stuck. This is when an understanding of complex systems kicked in (though I did not know what it was called then) and we began to apply adaptive thinking. The root of our problem was that the company was simply too complex for a small, centralized team to drive innovation for the entire organization. This was a company with nearly 60,000 employees, a GDP bigger than the country of Colombia, global operations in almost every country, a massive partner network and more Vice Presidents than we could count. By utilizing a Complexity Lens, we stopped thinking of innovation as a centralized activity for a few people and began thinking of innovation as everyone’s role. We started to consider the idea that everyone can innovate and opening innovation to the entire organization was an absolute must. The concept was bit humbling. We wanted to be the creative geniuses who launched the organization into a new era but this was clearly impossible. In a way, we felt we were passing the buck. It was like saying that we were not smart enough, we were not working hard enough, or we simply could not produce. Pushing this concept up the chain of leadership was even more difficult because the bosses had similar feelings. In the end, though, it became clear that this was the way to go. So our role as the innovation team changed from controlling innovation to fostering innovation. It could not happen all at once. We had begun to mature as an organization, but we still needed to take steps. Our first step was to create a system that allowed everyone to generate ideas while we provided the tools allowing them to pursue those ideas, facilitating the process of turning ideas into opportunities, and creating the means for them to share their ideas among each other. Over the next few years, we took the methodology and systems that we had built for ourselves and opened it up to everyone by turning it into a framework that people could adapt for their own use. We walked around, figuratively and literally, looking at what people were working on and wherever possible promoting ourselves as a service to train and educate groups on how to move their ideas forward. While we did not have the technology at hand at the time to create total transparency, we did our best to create forums for people to share what they were working on and draw on each other’s ideas and approaches. This approach did not mean that systematic innovation methods were tossed out the window. Rather, we created a tool set of approaches for people to utilize and added to this tool set as we learned more. We recognized though that not every approach worked for every situation, so we allowed experimentation. In this sense, each group made their own pizza (read Change & the Pizza Principle) and after several iterations, the ones that worked best in this culture emerged as the norm. The impact was soon clear. In less than a year, the organization was launching more new innovations more rapidly, about one a quarter, than in all the previous five years combined. But while there were more launches, they were generally smaller ideas. Some were simply enhancements to existing products, while others were efficiency gains, and still others were products that were adapted from our internal operations that we repurposed for our clients. None were the big silver bullet ideas that management hoped for, but out of these small ideas two ended up producing $30 million between them in the first year and the risk was very limited. Failures were equally small and isolated and the wins more than offset any losses. I did not hang out to see this system in full implementation as I had received a new assignment overseas. When I returned after three years abroad, I found that the innovation team had continued to launch more and more products and enhancements. What was even more interesting was that these smaller innovations eventually enabled a big evolutionary leap. During this period, the internal and external circumstances aligned for the development of a new business that incorporated many of the innovations into a packaged offering. This business quickly became a nearly $200 million a year operation. The silver bullet emerged as a result of the cumulative innovation. There are a number of very innovative companies that have discovered variants of this approach. Legos, for example, has extended innovation by inviting customers to create ideas and participate in the financial success while Pixar has documented its highly successful approach in “Innovate the Pixar Way, Business Lessons from the World’s Most Creative Corporate Playground.” Of course the approach is unique in each organization, but they have a principle of a centralized framework and quality assurance coupled with distributed innovation. I have since learned that this fits well with the theory surrounding complex adaptive systems. Generally speaking, evolution does not usually happen in a single great leap. Complex organisms produce and experiment with small adaptations. Some work, some fail. What eventually happens is that they accumulate over time and eventually a tipping point is reached and an evolutionary event changes the system forever. By letting go of the centralized systematic approach and enabling innovation to occur across the organization, evolutionary transformation is made possible.